<<< Special guest – Rachel Brimble! Giveaway – here it is as promised! You all recently pushed the sales ranking of ALL OR NOTHING to the all-time high of #38 and I promised you a giveaway. So here it is! Enter as many times as you want. It’s easy! One lucky entrant will win a $25 Amazon gift card. 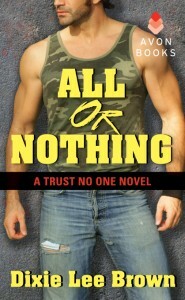 Check out the Trust No One series! 11 Responses to Giveaway – here it is as promised! I just read Come Away with Me and really enjoyed it. Lol! Not at all, Andrea! But you’re a stronger woman than I am! Thanks for your comment. Good luck! You’re welcome, Donna. Good luck! I just got When I Find You! Just finished Perfect Fling by Carly Phillips and am reading Three Little Words by Susan Mallory now. I also recently read Dark Waters by Toni Anderson and I loved, loved it!!! I have read so many lately, but I truly did enjoy both of these stories. I read them in the opposite order though, but I really hope that we can have more in the future. Another that left an impact was An Unexpected Woman by Sandi Layne (http://www.amazon.com/An-Unexpected-Woman-ebook/dp/B00DVMHVVA/ref=sr_1_1_bnp_1_kin?ie=UTF8&qid=1375745661&sr=8-1&keywords=an+unexpected+woman+sandi+layne). It was really powerful.